Purchasing a vehicle these days is like adding a new member to the family. However, if the coating of a car is destroyed and not washable, you are forced to look for a new one. You bought your new sports car, it’s fantastic, and you want it to stay that way. For that, look to the latest innovation: Ceramic paint coating has become a popular choice for many people. With ceramic coating, you are guaranteed that your car will give you that sense of joy and pride. Adoption of Ceramic Pro coatings will offer your car a quality interior and exterior. Ceramic Pro coating for the car helps it maintain its look for a long time. There are many types of ceramic paint coatings; the best among them is a Ceramic Pro. Ceramic Pro has a hardness level of Ceramic Pro 9H. Most coatings have a hardness level between 4 to 7H. This coating is very different; small abrasions will not affect your vehicle. It is the hardest coating on the market currently. It acts as a sacrificial layer because of the new glass shield that repels scratches. Any surface with a scratch can be easily corrected using a light polish without changing the original paint. With UV protection in glass shield, the color will not fade away quickly. All this gives you peace of mind in harsh weather conditions. Why should you invest in Ceramic Pro? We’re talking maximum protection to your car’s interior and exterior. It will not deteriorate rapidly so it gives you more service for a longer time. While the ceramic coating price is considerably high, the ceramic p will give you the best bargain in the long run. Ceramic paint coatings will keep your car perpetually off-the-lot new. Once the coatings have been applied, you will realize that its gloss and reflectiveness are beyond compare. With diligent maintenance of your vehicle’s finish, it will shine for a good long time. The sleek coated surface will prevent dirt, tar, or dust from sticking to the paint. Washing your vehicle will be effortless and less time consuming. Waxing will be a thing of the past. Waxing your car was the old way to get a protective coating on its surface. Wax sealant is not enough because it offers less protection and wears off quickly. A fresh coat needs to be applied often which comes with additional cost. Using a single coating of Ceramic Pro will make sure that you will never need waxing – ever! Ceramic Pro coating price seems prohibitive at first glance. Looking at the situation in a different light is essential: wax sealant last for about two months and need to be reapplied frequently; let us say quarterly. For a quality wax job, you will spend approximately $200 four times each year. That’s around $800. In the next five years, you will have paid about $4,000! 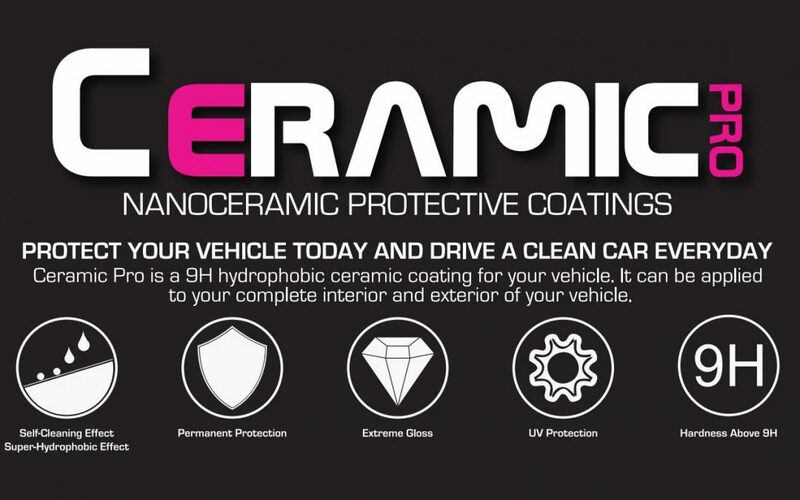 Ceramic Pro is the best ceramic coating for cars because it is effectively permanent. It needs a single application in the average lifetime of a vehicle. You will save more money compared to waxing. Water that we normally use is hard water with high mineral content. When we use it to clean our cars, it leaves marks which are hard to remove. The best ceramic coat car paint protection is a Ceramic Pro; it is chemical resistant and hard water will have zero impact on the surface of the vehicle. A vehicle that is treated with a Ceramic Pro will keep rail dust from clinging to its surface, reducing the chance of damage. Bird dropping is a huge issue that causes damage to your vehicle. Ceramic Pro is the best cure because bird poop won’t stick to your car, nor will it corrode your paint. For the best application of Ceramic Coating Pro, make sure that you find a specialist. Due to its superior protection, it is now the most sought-after paint coating for many car owners. Everybody wants to keep their cars for a long time, so do it with Ceramic Pro coating.